Since it's been over a year since I went Vegan and four years since I moved to Korea, I think it's time to combine those two parts of my life and show you what I eat in a day. Warning: I'm lazy and stingy BUT love all the food, so these meals are a mixture of simple, addicting, and cheap. We combine a lot of Korean and Western dishes. Korean food since it's easiest to buy the necessary ingredients, cheap, delicious and very convenient for meal prep. Western food because I just can't live without oatmeal, muesli, and salads. We usually eat more of a late coffee/snack/brunch than a true breakfast. I like getting up early and immediately start working - like some quick sketches or doodles to start the day on a nice note. Then, my bad conscience will speak up and get me to answer work emails, send client sketches or finished pieces for feedback, shipping Etsy orders, or just other business stuff. Several hours later I get hungry and desperately want a cozy caffeine-infused break! My Vegan supplements - I've got a tendency to go for the cheapest options. Korean rice cakes (called "Ddeok") are my favorite comfort food! When steamed over boiling water they get that perfect chewy texture and especially Songpyeon with sesame paste filling I could eat by the dozen! They keep forever in the freezer, so we buy them in large portions at our favorite store (or order online) to always have a quick snack on hand. Kinda stupid but true: Immediately after eating breakfast I usually start cooking. A lot of Korean dishes like soups and stews taste best when prepared in advance and simmering or marinating for a couple of hours. That means I'll wash and soak rice, start boiling soup ingredients or marinate tofu just after our late breakfast, usually around noon. Doenjang Jjigae - Beanpaste Stew. For more flavor, let dried mushrooms, Tashima seaweed, garlic, onion skins, and maybe some cabbage or carrot pieces boil for a long time, then add the bean paste, tofu, potatoes, zucchini, broccoli, fresh mushrooms (really, anything you want!) about 15 minutes before serving. Adding the bean paste at a later stage gives me the chance to actually taste if the soup base has enough flavor without it - relying solely on Doenjang for flavor can make the stew too salty. On the topic of lazy: Lots of Korean dishes are perfect for long-term storage! All the side-dishes like kimchi, for example. I just take them out of the fridge when I need some extra oomph for a lazy meal. Plus a bowl of mixed grain rice out of the still hot rice cooker... again, cooked on the day before with minimal work because Korean rice cookers are my saviors! I had some leftover balsamic glazed onions that I mixed in with a random salad. A quick simple dressing I always use: Dijon Mustard mixed with just a bit of lemon juice (I use the bottled lemon juice essence since fresh lemons are expensive here in the Korean countryside) and either maple syrup or Maeshil. Maeshil is a syrup made by fermenting green plums in sugar. Since we make a huge batch of this every year it's a cheap Korean substitute for maple syrup in savory dishes. It has a sour-sweet taste, so it doesn't work in most sweet dishes! Korean Rice Cakes "Ddeok" are saviors for vegan-friendly desserts! Ahem. I wanted one more rice cake, so that was dessert. Eating dessert isn't a thing in Korea. If any, you'd eat fruit - which I use as an excuse to cut up an apple and eat that on top of the rice cake. My husband is always amazed at how I can actually fit in more food after lunch. ... But he did join me in the afternoon for a bit of leftover watermelon. There's this one month when they're super cheap here on Jeju. If you visit the traditional markets during July, you can get two watermelons for just 10000 Won (a bit less than 9$) and we eat them like there's no tomorrow! I also drink a lot of tea since I'm trying (emphasis on trying) to be less of a coffee addict. A couple of years ago, I was still drinking five to eight cups a day, so I've come a long way! My current favorites: Chai by TAZO and this strange but delicious Kombucha Green Tea. After that huge meal for lunch (plus dessert. Plus watermelon.) I was happy and full and didn't really need a dinner. Eating a big, elaborate meal for lunch is my go-to trick to save time on cooking while still getting to eat homemade, from scratch, plant-based, everything-I-want meals. I then save time by eating a simple dinner (or none at all). My husband usually works after his restaurant shift is over later in the evening - so on most days, we have a separate schedule for that meal anyway. I love oatmeal. Especially hot and dense and mushy oats! When I want a quick, small portion, I just throw together water, whole-grain oats (I use these) with just a pinch of salt - or some nut milk instead of water if I feel fancy. Microwave that for about 40 seconds, add cacao powder or cinnamon or some chia seeds, top with frozen blueberries and voila! Berries are very pricey here on Jeju Island in particular. The best choice is frozen berries from a large supermarket like homeplus or emart, where you can get them on sale and then use sparingly for several months. As for nut milk: It's an on-going battle of trying to find good vegan-friendly ones here. There's soy milk everywhere, and soy milk with nuts mixed into it, but those contain non-vegan Vitamin D and sometimes even milk (seriously!). I have a 50/50 chance of finding Almond Breeze at E-Mart on any given day, and the rest of those milk variations pop in and out of stores. I loved that hemp seed milk but now I can't find it anymore! So I'm mostly down to just water. That's it for a quick and simple day of eating here in Korea! I focus a lot on homemade meals, cooked in large batches and frozen for convenience and saving money. Living far away from Jeju City (the nearest big supermarket that has, you know, bananas, avocados, nut milk and other "exotic" stuff is a one hour drive away...) makes most of the typical vegan recipes I find online difficult to follow. Living without hummus and guacamole and bananas - it's a bit of an anti-thesis to most Vegan recipes and What I Eat In A Day videos I consume. But I adapt and improvise - making hummus-like dishes out of different beans, focusing on typical Korean ingredients and making vegan versions of Korean meals. We even make our own Kimchi! All in all, it's a very cheap and simple way of cooking. If you're looking for more restaurant tips and a vocabulary guide (how to order vegan food in Korean!) I've got you covered. 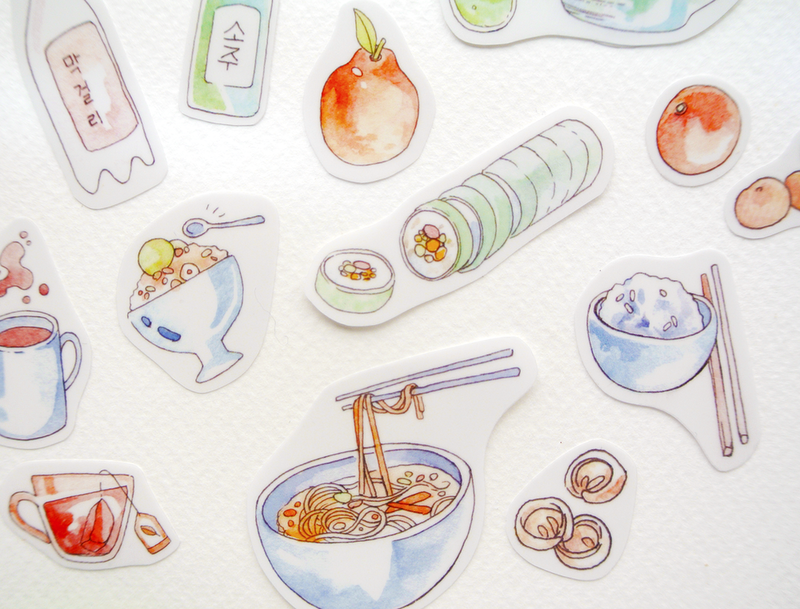 I made stickers out of some of my food diary illustrations from both my time in Thailand and my daily life in Korea. 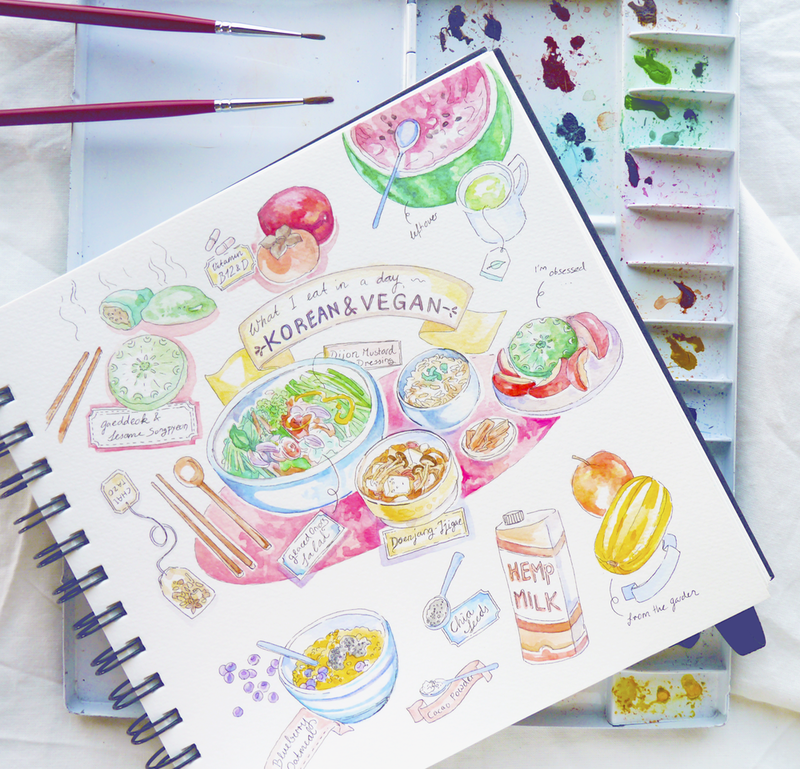 Hopefully, these inspire your own meal planning in planners, notebooks, or journals! Hand-drawn watercolor food stickers, printable. 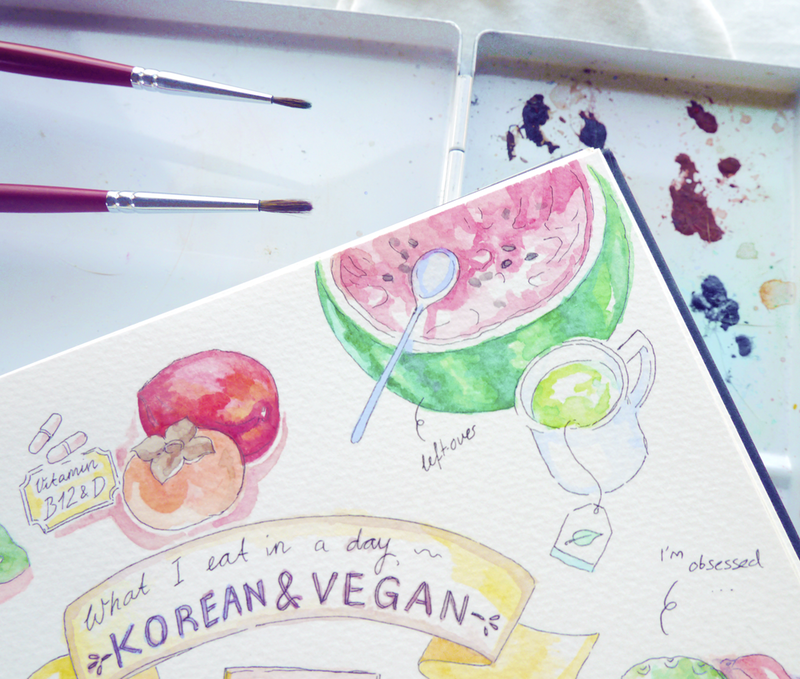 If you're interested, I'd love to create more illustrated meals or even recipes for simple Korean vegan food. While I often focus on practical meals, I actually love cooking and experimenting with new flavors and am more than happy to share!